Sooo ... Costa Rica won the group? Can Premier League take action against him? Suarez will say "What was I supposed to do? Not bite him?" Pushed his shoulder to his mouth, my a--. there's a clear move from Suarez to Chiellinis shoulder. anyone saying it's not a bite is lying to themselves. If it's not a bite then it's a kiss and i'm pretty sure that's not the case. And you have to take according to his history of biting people in tight games. A mans gotta eat people! How about a few thoughts for amazing Costa Rico, Boot Roomers? Won the group without a loss. A group with England, Italy and Uruguay. A country of 4.85 million people!!!! Well said Boston - in among all that chaos, Costa Rica qualified top of Group D. What an outstanding achievement! Suarez better show up to the post-game team dinner, or he will get the cold shoulder. @count dracula - best comment so far! yes...he didn't bit him, he just leaned in, opened his mouth leaned in some more, and then closed it. *smh* I think people claiming he didn't bite need as much help as he does. Are the 11% Liverpool & Uruguay fans by any chance? @Boston- I don't think anyone from a CONCACAF nation is as surprised by that as those outside of CONCACAF. Costa Rica are a good side that were overlooked because they play in a 'lesser' region. In the slow motion replay you can clearly see Suarez put his open mouth on his shoulder and then close down on it. I can believe anyone would even question that it was a bite. It isn't like this is the first time Suarez has done this. 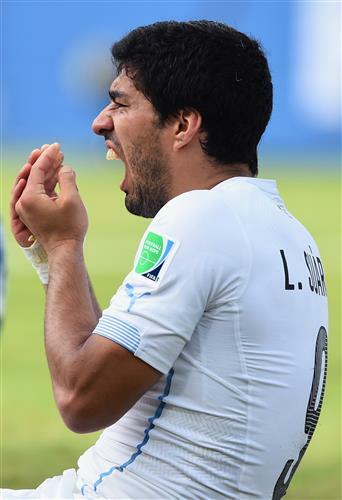 Tabarez on Suarez bite: "I'd like to see the images first. If it happened, the referee probably didn't see it." He didn't comment further. Okay, but now for the important stuff, like his new nickname...Hannibal? Choppers? Luiscula? Bitey McBitenstein? I think the best thing in the BR today was all the England fans watching the Costa Rica match and their disbelief at the biting incident until the pictures arrived. How he did not get a red card for that is beyond me! If Suarez had punched, elbowed, kicked, or choked someone away from the ball, (as other players have done this WC) we'd be upset, but not calling for lifetime bans. Violence is violence, and this punishment should follow the precedent of other recent actions. Suarez must really like Mike Tyson. This incident will not affect his move to Barca. He will not get disciplined on club level for a mistake during international play. This is the Year Of Underdogs. It has been an exciting and controversial World Cup. Love it!!!! Erick, I have to say that FIFA could well give him a worldwide ban, which would cover any type of football, including the club game. Hannibal Suarez does have a certain ring to it. Hollywood is creating a new trilogy "Lord of the bite"
Remember, Costa Rica got ripped off in qualifications by having the snowstorm game result stick. Used to be Cannibal of Ajax. Now what? Bashel - if this was an isolated offense, maybe. But come on - repeat biting offenses? There is no place for that in soccer (or any sport)! I was so mad that I put off a planned outing for the kids until tomorrow to watch this match. Then there was a red card controversy, Suarez bit somebody and the Boot Room became one long string of comedy and entertainment. Glad we could be of service Martin! Well if Liverpool sell him, I doubt it will be to an Italian club. Suarez needs a ban at the start of each season to play outstandingly well. Shanka, I understand where you're coming from regarding Chiellini's play-acting, but nobody deserves to be bitten! @Pappy- the snowstorm game was a non-issue. If you want to bring it up, how about high-elevation matches, high-heat matches, or any other type of weather that doesn't suit a team? I am sad for Suarez's future. This could be a very long ban. Great talent, rocks for a brain.